Abstract - An image compression coding technique involves transforming the image into another domain with Curvelet function and then quantizing the coefficients with modified Set Partitioning in Hierarchical Trees algorithm (SPIHT) has been presented in this paper. Curve functions are effective in representing functions that have discontinuities along straight lines. Normal Wavelet transforms fail to represent such functions effectively. SPIHT has been defined for normal wavelet decomposed images as an embedded quantization process. If the coefficients obtained from Curvelet transform of the image with more discontinuities along straight lines have to subject to quantization process with SPIHT, the existing structure of the SPIHT should be modified to suit with the output of the Fast Curvelet Transform (FCT). In this paper, a modified SPIHT algorithm for FCT coefficients has been proposed. The results obtained from the combination of FCT with modified SPIHT found much better than that obtained from the combination of Wavelet Transform with SPIHT. Abstract - The main goal of wireless sensor networks (WSN) is to gather data from their environment. This gathering should take into consideration the life of the battery of each sensor node to maintain the continuity of the network. The technology of multi-agent system (MAS) can be adopted in large scale WSN for reliable wireless communication with high energy efficiency. In this paper, we propose a scheme for data collection based MAS for sensor networks based on clustering with the use of a mobile agent to collect data according to a routing scheme. The main idea is to assign nodes to the data processing function rather than providing data to the base station (Sink). For this, an agent is introduced into each node of the network to process data locally and to judge their importance to remove any irrelevant redundant data. Then, the nodes are clustered together, each consisting of a Cluster-Head. The latter will then determine a scheme for the nodes belonging to the same group, using the Local Closest First (LCF) algorithm. In addition, for the agents (nodes) in a cluster cooperate to eliminate inter-node data, we propose a mobile agent (MA) sent by the Sink to collect data between the cluster nodes according to the LCF itinerary. Successive simulations in large-scale WSN with different densities show the capacity of the proposed collecting regime to extend the lifetime of the network in terms of energy consumption and the rate of packet delivery. Abstract - This paper reviews the three Conditional internal activity Techniques for high performance flip-flops namely Conditional Capture, Conditional Precharge and Conditional Discharge techniques. These techniques are reviewed in terms of power and delay and classified based on how to prevent or reduce the internal switching activity. Application of the Conditional techniques results in improvement of Energy-Delay product and saving of power consumption for quiet input. Low power flip-flops are vital for the design of low-power digital systems. In this paper low power high performance flip flops are reviewed based on these techniques .Comparison summary of recent results of flip-flop characteristics based on these techniques is also specified. 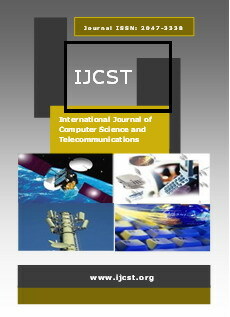 Abstract - In recent years, the mobile devices are equipped with several wireless interfaces in heterogeneous environments which integrate a multitude of radio access technologies (RAT’s). The evolution of these technologies will allow the users to benefit simultaneously from these RAT’s. However, the most important issue is how to choose the most suitable access network for mobile’s user which can be used as long as possible for communication. To achieve this issue, this paper proposes a new approach for network selection decision based on Saaty’s Fuzzy Analytical Hierarchy Process (FAHP) and the Technique for Order Preference by Similarity to an Ideal Solution (TOPSIS). The FAHP method is used to determine a weight for each criterion, and the TOPSIS method is applied to rank the alternatives. Simulation results are presented to illustrate the effectiveness of our new approach for network selection. Abstract - Turcicum Leaf Blight disease in Maize are the most major diseases which appear as spots on the leaves. If not treated on time, causes the rigorous loss. In this paper proposes a novel methodology of an image processing methodology to address one of the core issues of plant pathology i.e. disease identification and its grading. At first, the captured images are processed for enhancement. Then image segmentation is carried out to get target regions (disease spots). Later, image features such as shape, color and texture are extracted for the disease spots based on histogram. These resultants features are then given as input to disease classifier to appropriately identify and grade the diseases. Finally, based on the phase of the disease, the treatment consultative module can be prepared by on the lookout for agricultural experts, so plateful the farmers. Abstract - In the wireless network, whenever a mobile node moves from one cell to another - called handover or handoff, the call needs to be handed off to the new base station, and then network resources must be reallocated. Many mobility prediction schemes are proposed to perform resource reservations in advance so as to reduce the handover latency. Such approaches make use of knowledge patterns of location being mined from the mobility history of users to describe and predict the movement of mobile users. In addition to the location characteristic, the time-of-day also plays a crutial role in modeling the movement and it has attracted several research interests recently. In this paper, we investigate simultaneously spatial and temporal attributes of data and apply a spatiotemporal data mining technique to discover frequent mobility patterns for predicting the next location of a mobile node. Our approach is to mine frequent mobility patterns with time and then to make use of them to construct temporal weighted mobility rules. This paper extends a mobility prediction algorithm by finding the best matched rules which are temporally closest to the query time. Our experimental results show that using the temporal attribute is necessary for improving the prediction accuracy. Abstract - Global warming is the recent challenge to world. Governments of various countries in the world, at this time, are concentrating on the methods of reducing it. Both developed and developing countries are using fossil fuels in large quantity to meet their energy demands. The burning of fossil fuel produces CO2. Man-made emission of CO2 in atmosphere is highly responsible for global warming. In this paper, it is proved mathematically that how can global warming be reduced by using renewable energy resources (especially, by Wind Energy Conversion Systems & solar PV cells). This paper focuses on the importance of renewable energy resources with the help of EDFFQT curve. A new idea of directly and indirectly affecting renewable energy resources on global warming is also discussed. Abstract - Program Visualization (PV) is a technique that has been found useful in teaching computing programming. This has seen proliferation in development of PV tools with an aim of enhancing teaching/learning programming over the last two decades. However, the tools usage has remained minimal. Perhaps because it becomes challenging to ascertain the appropriate tool for the right task. This paper presents a classification of program visualization tools with the focus of aiding teachers and students in choosing the most appropriate tool for an interesting experience in the classroom. The paper is based on six various PV tools evaluated over a period of two consecutive academic years in a Kenyan public University. The classification augments the Price’s taxonomy of software visualization arm of PV by presenting four basic levels which are further subdivided into lower levels. Abstract - Respiratory disease is a medical term that encompasses pathological conditions affecting the organs and tissues. A lungs disease affects health condition of many people. Lungs diseases can be curable in early detection. Spirometry is valuable for diagnosing specific lung disorders as well as detecting lung disease at an early stage. Spirometry (the measuring of breath) is the most common of the pulmonary function tests and uses an instrument called a spirometer to measure the amount of air entering and leaving the lungs. This test is often used to help doctors diagnose and determine the severity of various respiratory diseases. The output of spirometry is in the form of graphs i.e. flow-volume loop and volume-time curve. This graph gives various parameters that are used for spirometry modelling. In this paper, various pulmonary diseases such as obstructive, restrictive and mixed lung disorders are classified using statistical data mining approach. This classification helps a physician in diagnosis process of various diseases. This approach is used to increase the efficiency of classification. Abstract - Orthogonal frequency division multiplexing (OFDM) is becoming the chosen modulation technique for wireless communications. OFDM can provide large data rates with sufficient robustness to radio channel impairments. Multiple Carrier Modulation (MCM) technology using FFT and IFFT. The Discrete Fourier Transform (DFT) plays an important role in DMTIOFDM systems. Because of the computational complexity of N-points DFT is O(N2),it takes large operation time and power consumption to perform DFT directly, especially in large transform size. Hence, various FFT algorithms have been proposed to reduce the computational complexity This paper presents a new VLSI architecture for computing the N point discrete Fourier transform (DFT) of real data and the corresponding inverse (IDFT) based on Fermat Number Transform (FNT). Abstract - In this paper we propose feature extraction for Telugu handwritten recognition based on the candidate search and elimination technique. The initial candidates for recognition are found by applying by zoning method on input glyphs. We propose cavities as a structural approach suited specifically for Telugu script, where cavity vectors are used to prune the candidates by zoning. It gives the 100% features and cavity features of the input dataset. Abstract - Secured data transmission in a multinode network (MN) depends upon various factors; such as number of user, nodes, channel capacity, failure rate of keys and nodes, path allocation criteria and encryption methodology. In order to keep the routed thorough the various nodes continuous scanning and up gradation of nodes is essential. This paper includes the work done by the researchers in the field of data security in multi-node networks (MN). The flaws in various techniques are also highlighted in the work. Abstract - A computational Grid is a hardware and software infrastructure that provides dependable, consistent, pervasive, and inexpensive access to high-end computational capabilities. Grids are emerging as a new computing paradigm for solving grand challenge application in Science, Engineering and Economics through sharing and collaboration of heterogeneous resources. Scheduling is one of the research issues in grid. Grid Scheduling is defined as the process of making scheduling decisions among resources from different administrative domains. The main problem in computational grid resource allocation is to discover suitable resources and to schedule separate tasks of an application on those resource in such a way to satisfy deadline requirement of the job with minimum execution time and cost. We propose a cuckoo optimization algorithm for optimal job allocation of resources on each node. This system will allocate the job optimally by considering the deadline requirement of the users and also the minimal execution time.